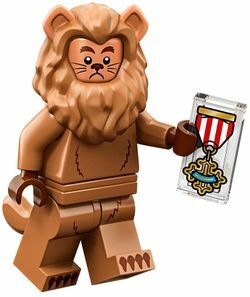 The Cowardly Lion is a The LEGO Movie 2 collectable minifigure released in 2019, based on the character in The Wizard of Oz. He first appeared as a video game character in Dimensions in 2015. 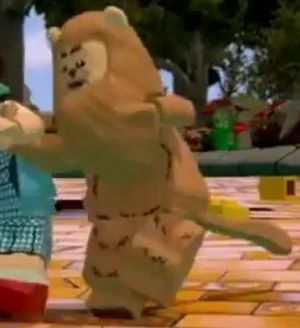 The Corwardly Lion in LEGO Dimensions. The Lion is based off his appearance portrayed by Burt Lahr. The Lion has a medium nougat mane which goes halfway down his torso. The mane is open around his head and at the top of the mane there's two circular brick yellow circular ears. The Lion's head is also brick yellow. His face has thick reddish brown over his eyes, which are black with white pupils. The Lion also has a reddish brown nose in between his eyes, his nose is connected by a black line to his mouth. On each side of his nose there are three black whiskers. The Lion's torso is mainly medium nougat except for the black outlines of fun going around the torso. The printing of the torso continues onto his hips and it creates a circular shape. There are several fur outlines on the rest of his legs as well. The Lion has a curved down medium nougat tail, medium nougat arms and medium nougat hands. The Lion was too cowardly to aim for the title "The King of the Forest", instead he spent his days in the forests scaring people who passed by. When Dorothy Gale, The Scarecrow, The Tin Man and Toto walk through the forest, he tries to scare them, and initially does. Dorothy tries to rescue Toto who's almost in The Lion's clutches and smacks him. The Lion starts crying and says he doesn't have any courage. Dorothy feels sorry for him and offers him to accompany them on their journey to the Emerald City and ask the powerful wizard who lives there for courage. The Lion then willingly joins the four on the journey. When they see the Emerald City, they rush for it through the poppies. Dorothy, The Lion and Toto fall asleep as the poppies have been enchanted by the Wicked Witch of the West. Glinda, the Good Witch of the South, awakens them by covering them in snow. Now awoken, they head for the city and after persuasion they are let in. The five are pampered and The Lion is given a bow for his mane. When The Lion sees the Wicked Witch of the West write "Surrender Dorothy" in the sky, he is beyond terrified. He later calms himself by imagining himself after receiving courage from the Wizard of Oz. When it's time to meet the Wizard, the Lion has to be dragged to meet the Wizard and faints when he sees him. When the Lion wakes up, the four tell him that they must get the Wicked Witch of the West's broom to receive their rewards. 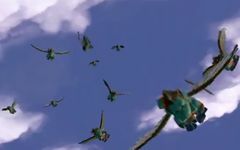 The winged monkeys who capture Dorothy and Toto. The Lion unwillingly tags along and is petrified when Dorothy and Toto get carried away by winged monkeys. Toto comes and shows The Lion, The Tin Man and The Scarecrow where Dorothy is being held captured. The Lion disguises himself as a Winkie and helps break Dorothy out of the room in witch she's in prisoned in. When the Wicked Witch of the West and the Winkies surround them, she decides to kill them off one by one. She starts with lighting The Scarecrow on fire but Dorothy tries to drench him with water, which she does but also drenches the Wicked Witch of the West. The Wicked Witch of the West melts and the Winkies are overjoyed that the group have killed their enslaver and they hand over her broom. The Wizard refuses to grant them their wishes even after they hand over the Wicked Witch of the West's broom. Toto figures the Wizard is really a human hiding behind a curtain and the four are disappointed. While not able to grant them their wishes properly the Wizard grants them all gifts that resemble the wishes- he gives The Lion a certificate of courage. When Dorothy is leaving, he cries and hugs her. He becomes joint ruler of the Emerald City alongside The Scarecrow and The Tin Man.